I know this is starting to feel like a food blog but it's not (at least not entirely). This is just my online space to journal my life and interests and part of those interests right now is learning how to truly nourish and indulge myself through what I eat. BUT I have to make two food posts in a row because something happened this week that made me so happy and so proud at how far I have evolved in just the span of a year that I need to shout from the rooftops and tell everyone who will listen. JAMIE FREAKIN' OLIVER HIMSELF (or more likely his social media team) LIKED MY POST!!! OMG!!! It's also fascinating to note the reach of celebrity. In Twitter, posts that are "liked" are sometimes, but not always, shared with followers. Who sees it is all down to the science of algorithms. Out of curiosity I looked at the activity for that particular tweet and in the span of less than twenty-four hours, over 25,000 people had viewed my cooking. Amazing. I am by no means fashioning myself a pro – although my cooking is damn good – but this just makes me want to try harder and evolve my palate even more. Oh - and patatas bravas is absolutely divine. It's shortlisted as one of my favourites. You can get the recipe in this book. Patatas bravas is a traditional tapas style dish from Spain. It is made up of fried potatoes and a thick sauce made of onion, garlic, carrots, pepper and tomatoes. I served mine with a side of chorizo (©Deborah Clague). My favourite celebrity chef, Jamie Oliver. His style is healthy, fresh and easy. Last year I started learning how to cook. This year I seek to continue building that skillset by attempting more difficult, and varied, dishes, as well as configuring the cost for eating healthy. My grocery bill has definitely increased as I focus on fresh and organic (where possible) but I'm not dining out as much so I hope to see it balance out. For example: earlier this week, I calculated that the turkey rice soup I make averages about $4.20/bowl (I get about six bowls per batch). In comparison, Tim Hortons charges $2.99/bowl for a serving of similar size with a side of bread. At face value, it appears to be a better business decision to continue dining out. But when ingredients are compared, the playing field shifts. My soup contains rice, humanely-raised turkey (breast), organic broth, heirloom garlic, white onion, carrots, celery, lemon, fresno pepper, turmeric and summer savoury seasoning. The equivalent Tim Hortons offering contains ingredients such as maltodextrin, artificial flavour, disodium insinate and caramel colouring (amongst other unpronounceable components). I want to know what I'm eating. I want to be able to pronounce and identify what I am putting in my stomach. For my first new dish of the year, I was inspired to take on something that has previously been an addiction of mine. KFC, Popeyes ... fried chicken tenders are VERY tasty but notoriously bad for one's health (and I don't dare look into their actual ingredients). I found an online recipe to replicate the former's famous eleven herbs and spices and decided to attempt them from home. Instead of frying in oil, they are baked in oven. Because of this, taste is not exactly replicated but this alternative is equally as good in its own right. I served with a side of garlic mashed potatoes and seasoned carrots. Total cost for this meal was about $8.00/serving, not including the two bottles of wine also consumed. To learn this recipe, check out RecipeTinEats. This weekend I tried something different. After reading "Jamie Oliver's Food Escapes" by my current favourite celebrity chef, I've become intrigued with the cuisine of Morocco, especially a hard-to-find spice called za'atar which a number of recipes from the region incorporate. Za'atar is a very fragrant, tangy blend of sesame seeds, thyme and sumac. After finally finding it in a local specialty store, I pulled together this recipe of za'atar lemon roasted chicken with a side of saffron-infused pomegranate rice. This was a partial success; I don't feel I've developed the palate for this particular spice (and there were too many other ingredients in the rice for the saffron to truly shine through), however, my partner felt it was very reminiscent of the food he ate while living in Africa years ago. He also ate all the leftovers. Yay! "Food Escapes" also talked about the communal ovens of Morocco which I found very interesting. Citizens fill clay pots called tangias with a variety of ingredients and drop them off to be slow-cooked over fire all day. The concept is a sharp contrast to the west's expectation of fast-food but I feel this would be so much more delicious (and obviously healthy). I would love to travel to North Africa to experience it. When I was a kid, I had an EZ Bake oven. I used to get so excited when my mother would buy me a new cake mix at Toys-R-Us knowing that I would soon make a delicious creation with nothing but a lightbulb. Science! In retrospect, it was nasty as hell. However, it did instill in me much admiration for those who could cook. It was something I always wanted to learn but in between building a career and a life, never really had the time or motivation to pursue. This weekend I completed my holiday baking and it's safe to say that I have advanced far beyond the elementary tools of my childhood. In fact, most of the skill I've developed has been honed just over the past year or so at the influence of someone in my life who wanted to see me be healthy ... and thus happy. It's worked on both fronts. I have been thinking a lot about how this is the first Christmas since my father passed away where I actually feel "in the spirit", having rid my life of most of the toxicity that encourages and instigates depression. I'm sure there are many reasons for that, but food plays a role in it as well. As proof, I have completed my holiday baking! This year I am handing out home-baked goods as part of my gift to loved ones. I'm not sure if they will all realize the depth of gratitude proffered with this gesture; in addition to incorporating the highest-quality ingredients I can buy (organic, locally sourced, pure), this is an extension of my being, of my growth, of my love in tangible – and very delicious – form. This was the final piece I baked this weekend. It is a traditional carrot muffin (my favourite) mixed with pineapple, coconut and macadamia nut. I felt it would be a nice pick-me-up to our long, cold, Canadian winter. The recipe is a slightly modified version from the blog KitchenTreaty.com. This was one of my favourite things that I leaned how to bake and it is absolutely DIVINE served heated with vanilla bean ice cream. Recipe was taken from the book 'Flapper Pie and a Blue Prairie Sky' by blogger TheKitchenMagpie. My favourite food blog is TwoPeasandtheirPod which is where I get most of my cookie recipes. Another one from TwoPeasandtheirPod that I modified slightly. This is a must for the season but I was also motivated to insta this when Kellogg's made a pledge to donate $20 to the Salvation Army with their #TreatsforToys social media giving campaign. I've never been a big soup fan. Soup is never something I seek out when I dine at a restaurant and I've never really had one that I felt like raving to friends about. But that was before I started learning how to cook ... now, soup – fresh, made from scratch soup – is one of my favourite things to make and indulge in. Today was a snowy, cold Saskatchewan day so I made a roasted turkey and rice soup that included Canadian heirloom garlic*, white onion, carrots, celery, freshly squeezed lemon, grated ginger, bay leaf and a special summer savoury seasoning from Nova Scotia that was gifted by a colleague. 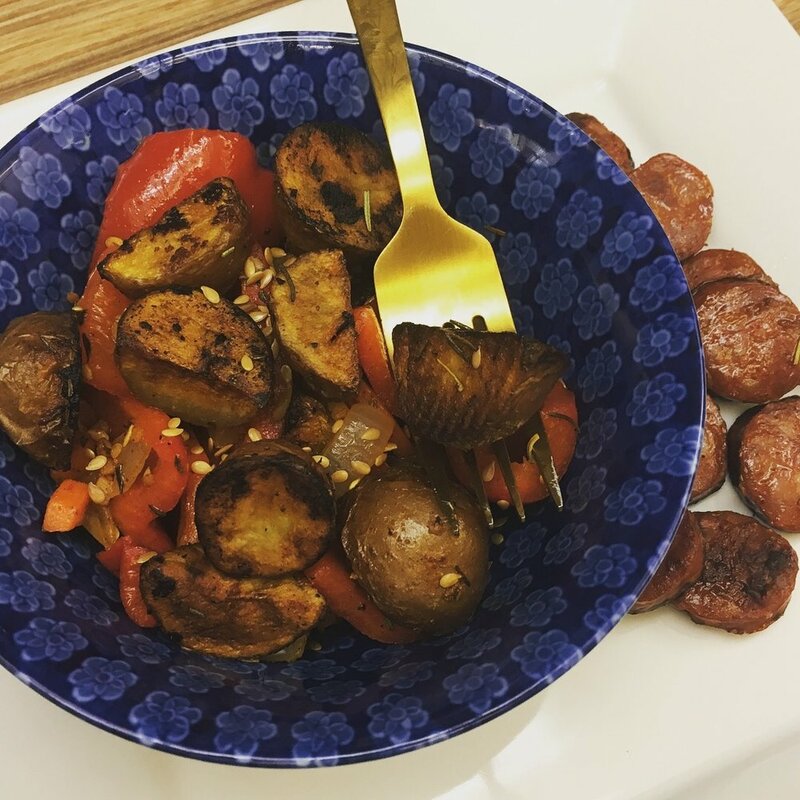 It was healthy, hearty and absolutely delicious! The flavouring could not be more perfect and left my tummy feeling so good. This dish will definitely go into regular rotation for me this winter. The base was another easy-to-follow recipe by twopeasandapod that I modified to my tastes. *I am totally becoming a garlic connoisseur. The robust flavour of this particular variety is amazing. I squeezed one last bit of fresh lemon into the soup before serving with garlic bread. Preparing the ingredients. In total, this soup took two hours to make from start-to-finish. I've decided to "share my work" as I learn how to cook and bake. Every week I try something new. In some instances, like this example that I made from scratch this weekend, the results are amazing – the combination of spices was fragrant and flavourful. At other times though ... the results have been a bit disastrous (will get to this another day). Regardless, in less than a year, I feel I have made great progress. For Moroccan baked chicken, I used an easy online recipe by The Stay At Home Chef for the meat portion and my trusty 'Posh Rice' cookbook for the rest. This has become my main go-to resource for dinner. There are infinite ways in which to dress up this staple and I am on a mission to try them all. This version incorporated basmati with allspice, red onion, garlic, cucumber and chicken stock. I bastardized the original recipe slightly and substituted pine nuts and pumpkin seeds for sliced almonds, and cranberries for pomegranate which I couldn't find in the grocery. Once done, I garnished with fresh coriander. I'm in the process of limiting meat intake but when I do, I use certified humane. This is a personal choice which might seem naive but I believe that if an animal is sacrificed for my pleasure, then the least I can do is support a better life for it while alive. This chicken was marinated overnight with a mixture of lemon juice, smoked paprika, cumin, turmeric, cayenne pepper, cinnamon and ginger. 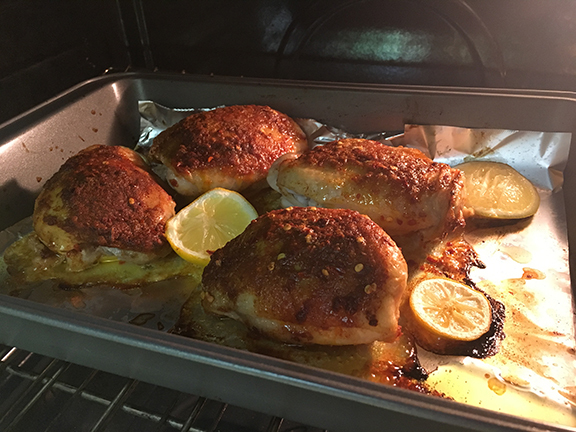 The following day, I squeezed more lemon juice overtop and placed pieces of the fruit with the chicken in the oven for forty minutes (400 degrees). My dinner companion was greatly impressed and proceeded to eat all the leftovers the following day, leaving me to make a sandwich. While I might normally be annoyed, I made him do handyman work in my condo all weekend so I figured it was a fair trade (bartering is another skill I am mastering). My own personal review is that this chicken was some of the best I've ever eaten. The marinade was perfect. I will next attempt it on some of my other favourites.